If you were a scientist and, in an effort to find out the key ingredients of a “Frontier Camp experience”, you were to heat it up in a Bunsen burner, you’d distill the ministry down to a simple formula: Faith + Fun + Friends + Food! Over the next few weeks during our Friday stories, through the writing pen of guest blogger, Kate Humes (a seven-year camper and a three-year staffer), let’s take a look at each of these components. Won’t you consider writing in a comment with a short story of your own on how one of these ingredients impacted your time at Frontier Camp? Food, friends, and fun are great, but they are purely material without something deeper and bigger holding them together, giving them meaning. That something is faith. Faith is defined as putting your complete trust in something or someone. In this case, Frontier Camp’s goal is for others to place their faith in Jesus Christ as our Savior and the Bible as His Word. The foundation of Frontier Camp is the desire to reach people with the good news of Jesus and to continue to nurture faith in Him through spiritual growth. What keeps the full-time staff working hard year round? Why do hard-on-cash college students want to work all summer for a light paycheck? What keeps the Board of Directors serving voluntarily? It is their hope to witness to kids and families, fueled by their individual and personal relationships with Jesus Christ. Their willingness to serve God and bring more people into His kingdom is the reason they sacrifice so much. 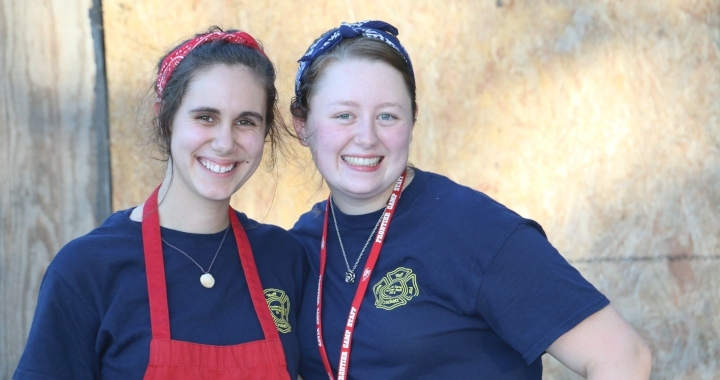 These sacrifices include time, energy, and earning potential to serve at Frontier Camp. They show the campers, through their joyous, continual and sacrificial service, that their faith gives them hope for this life and beyond. Writing about faith and Christian camping can quickly turn into a cliché Christianese tract. But neither FC nor Christianity are in any way cliché. Christian camping reaches a unique sector of people, and is more than a summer ministry: camps are reaching people year-round. During retreat season, FC ministers to others by hosting a variety of groups, churches, and organizations that are partners in the mission to teach about God. As far as summer camp goes, there are three main groups of people FC wants to teach about faith. 1) the campers, 2) the camper parents, and 3) the summer staff. FC loves to introduce campers to Jesus, highlighting the greatest act of love and service, the death and resurrection of God’s son, Jesus Christ. To those who already know Him as Lord, they want to reinforce God’s love through teaching and living it in front of the campers. A “secret mission” of FC is their ministry to the summer staff; camp wants to hire strong and faithful witnesses. And they want to send the staff back into the “real” world with a stronger and deeper faith in Christ. Training weeks are opportunities for the full-time staff to remind the summer staff that they are always ambassadors for Christ, both at FC and at home, school, work, etc. Many summer staffers have grown up in the church but have never taken steps to pursue Him in every aspect of their life. Through their emphasis on discipleship, FC helps them cultivate their own personal faith so that they are better equipped to serve the campers and parents. No matter how resilient a person, the trials of FC will test any amount of the staffer’s willingness to serve. When they are working hard in the extreme heat, exhausted, and emotionally drained, smiling and talking about the love of Jesus is a tall order. Without spiritually filled staff, the primary ministry to campers and camper parents becomes a mission impossible. The third group, the one with whom the camp has the least amount of personal contact, is the camper parents. FC relies on the small window of time during camper drop off and pick up to make a positive and, hopefully, lasting impression. During the camp week we provide daily updates for the parents. These updates include the spiritual thrust for that day. Then there’s the ride home, listening to their campers hopefully talk about what they have learned during the week. These are all opportunities for parents to be encouraged to lead their families to grow closer to God. Faith is the fuel of FC, as well as the goal: to strengthen faith, to hope that some renew their faith, to pray that some will begin their own journey as a Believer, to follow the example of our Lord and make disciples of all nations. When it comes to camp staffers, there is little formality, no fancy clothes. They carry no phone and everyone is sweaty, sunburned, and sporting a thin layer of red dirt. Most are wearing Chaco sandals. You might say they are the modern equivalent to the first century Christ-followers. These early men and women had no frills or modern comforts, much less than even the piney woods of Texas. At FC the reality is not always comfortable, but our faith unites us. Staffers expend high energy, withstand Texas summer heat and long days for one reason: to share and live out the Word of God, much like the early church. The fact is, kids get saved at camp. We could argue this is what makes FC successful, but that is also missing the point of camp. Camp’s job is not to save people but to plant seeds of the gospel, in the hope that they will take root, either at camp or elsewhere. Rodeo can get rained out and Bible drama can go awry. In spite of any hiccups, campers still leave Frontier Camp each week with renewed faith, with questions about God burning inside them, or the story of how they committed their life to Christ for the first time. We always hope the fun and excitement of Frontier Camp will make campers look forward to their return next year. But we also hope that, even if they don’t come back, they have left a little wiser about God and with more knowledge about faith.